Lysine is an amino acid that helps minimize the symptoms of herpesvirus infections in humans, and it also helps minimize the symptoms of a different kind of herpesvirus infection in cats. Feline herpesvirus 1, also known as FHV-1, is the viral cause of feline viral rhinotracheitis, also known as "kitty flu." FHV-1 infections cause irritation of the eyes, nose, and throat of the cat, along with fever, loss of appetite, loss of energy, and sometimes pneumonia. After the initial infection, the cat's immune system usually keeps the virus in check, but giving birth, nursing a litter of kittens, extremes of temperature, and the stress caused by moving to a new home can trigger a new round of symptoms. The virus is not transmitted to or from people. FHV-1 infections are especially common in animal shelters. It is spread from cat to cat by direct contact with nasal secretions from an infected cat, and by shared bowls, toys, and bedding. If a pregnant cat has an outbreak of FHV-1, the unborn kittens may be spontaneously aborted (without veterinary intervention). If the cat only carries the virus, she may pass it on to unborn kittens while they are still in the womb. 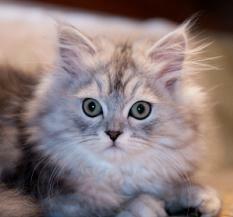 Loss of appetite in kittens caused by the virus can result in starvation and death. The amino acid lysine helps the immune system keep the virus at bay. Before causing a repeat outbreak of symptoms, the feline herpesvirus literally dissolves the cell in which it hibernates. To do this, it has to make an enzyme with the amino acid arginine. Lysine and arginine "look" the same to the virus, so if there is a great deal of available lysine in the cell, the virus will incorporate lysine instead of arginine into the enzyme and stay locked inside the cell. Like humans with herpesvirus infections, cats with herpesvirus infections benefit from additional lysine in the diet. The typical dosage of lysine is 400 mg a day, delivered in the form of "kitty treats." Lysine is a lot more likely to be beneficial for cats that are not stressed; cats brought to animal shelters usually experience so much stress that lysine supplements do not do a lot of good. Unlike humans with herpesvirus infections, cats with herpesvirus infections are not treated with arginine restriction. The high-protein foods cats require tend to be rich in arginine. Adding lysine is the only nutritional strategy for treating FHV-1 in cats. Treatment with veterinary steroid drugs will cancel out the benefits of the high-lysine cat treats. Q. Can I give my cat supplements designed for humans? A. Yes, but it's a lot of trouble, and your cat won't like the procedure at all. I suggest either using kitty treats with lysine, or going to the vet to get Enisyl-F, which is a paste. You just dial the right dose and squirt into your cat's mouth. If your cat likes the taste, this is a great deal easier than trying to give your cat lysine tablets. In some countries, you can find a similar product called Viralys. Q. Do the cat treats work as well as Enisyl-F and Viralys? A. Yes. The main difference is that you can know the dosage your cat is getting if you use Enisyl-F and Viralys. But if your cat likes the treats, that is even easier for you. Q. I can't find Enisyl-F. How do I give my cat a pill? A. The procedure I've found works best is hiding a pill (you'd only need about half of a human dose of lysine for a cat) inside a treat that the cat likes. It's also possible to coat pills with peanut butter and apply directly to the cat's mouth, but I've found that this usually just results in a very unhappy cat and a big mess. I once got a nasty scratch on my nose from my cat when I tried the peanut butter procedure, so I have used the pill-in-treat method since. You may have to experiment to find the size pill that works for you. It may be necessary to cut a 1,000 mg lysine pill into quarters or eighths to get your cat's cooperation.